Yahoo Web Hosting offers web hosting, email, and domain registration services to small businesses. Since 1998, Yahoo’s web hosting division has been providing shared hosting plans, email services, and domain registration for small businesses under its Yahoo Small Business brand. This line of products was slated to be sold to Chinese retailer Alibaba in 2015, and in preparation for this sale, Yahoo renamed their Small Business product to Aabaco Small Business. However, the hosting company is now using its original brand. If you’d like to purchase a hosting package from Yahoo Web Hosting, click the button below to get started. By using this link, you’ll get 35% off your hosting for the first three months. Your discount will be applied automatically, so there’s no coupon code you need to enter during the checkout process. On the fence? Not sure if Yahoo’s the right company for you? Yahoo offers a 30-day satisfaction guarantee. If you’re not happy with your purchase for any reason, simply cancel your account and receive a full refund of all fees paid (less domain registration). When it comes to website hosting for small businesses, Yahoo offers three different hosting plans from which you can choose. Each varies in its allocation of resources, so your job is to determine which option best fits your business’ needs — you want to buy enough, but you do not want to pay for things you do not use or need. If you are just getting started and you want to do so for as little money as possible, the Basic Plan has you covered. While Yahoo bills this option as one for “personal sites and blogs,” you can certainly use this as a stepping stone for your business’ website. You will also get account access for your colleagues or friends, which means that multiple people can manage your website without anyone needing to share their credentials. The mid-range Advanced Plan, which is Yahoo’s most popular offering, is optimal for small businesses. It includes everything in the Basic plan, plus more. More specifically, the Advanced Plan gets you 500 GB of disk space, 5000 GB of data transfer per month, 500 email addresses, site design tools, and $100 of advertising credit. You can create as many pages for your site as you’d like, and you’ll get support for PHP and Perl. For those with large websites serving high levels of traffic, the Premium Plan is a good option. In addition to everything in the Basic and Advanced Plans, the top-tier plan gets you an unlimited amount of disk space, data transfer, and website pages. You’ll also get 1000 email address, site builder tools, $100 of ad credits, support for PHP and Perl, and private domain name registration. The control panel is where you will manage your website, as well as handle administrative tasks related to your web hosting account. While there are free-standing options web hosts can choose to include with their web hosting options, Yahoo has elected to build their own. You will notice in some descriptions that Yahoo offers an unlimited amount of a resource to its customers. However, does unlimited really mean what you think it does? Similarly, Yahoo does not publish any limits or guidelines on its unlimited data transfer and email storage offerings — the company simply states that most people will not have issues with overuse. Will This Plan Work for You? It is hard to say. Without hard and fast guidelines, we cannot make any recommendations as to what you should do when it comes to web hosting — if you are getting started, you will likely not have any issues for a while, even if your website is on the larger side. Only when you grow sufficiently large will you find it necessary to consider a VPS plan (or even dedicated server) from another hosting company, since Yahoo does not offer these options. If you need a domain name for your website, you can get one free of charge if you purchase a hosting plan and opt for a contract that lasts one year or more. All plans come with 24/7 phone, email, and online support. Yahoo does provide some documentation, but its knowledge base is somewhat limited in its scope. Yahoo does not offer any WordPress-specific hosting plans, but the company indicates that its Advanced and Premier plans come with support for WordPress blogging. Because Yahoo does not explicitly mention any special support for WordPress users, you can expect to be responsible for everything related to your WordPress implementation: installation, setup and configuration, management, and updates. The mid-range and high-end web hosting packages come with the software and tools you need to support a WordPress site, but the hosting plans themselves do not come with extras like WordPress-optimized environments or free themes and plugins. If you are interested in launching an online store, you will likely be looking at a different type of hosting plan. While we have covered the basic web hosting plans for small businesses, Yahoo offers e-commerce options as well. Yahoo offers three different e-commerce plans from which you can choose, and all, including the entry-level option, comes with everything you need to launch an online store. Furthermore, the transactions fees levied by Yahoo decrease as you upgrade your plan type. If your goal is to launch a website to complement your brick-and-mortar store or to present information to your customers, the cheaper, general web hosting plan would be fine. If you want to sell more than a few items over the course of a month, the more expensive e-commerce option is a better fit for you. If you would like to earn additional revenue by displaying Google AdSense ads on your page, you can do so easily. Yahoo provides a widget that will handle the integration on your behalf, and you only have to add the widget onto your site and provide the appropriate Google code that identifies you and your website. All plans come with 24/7 phone, email, and online support. Yahoo does provide some documentation, but its knowledge base is rather limited in its scope. The price you pay for your hosting package depends on the length of your contract. You can choose to pay on a monthly basis, or you can pay upfront for one, three, or five years of service. The extended contracts come with discounts commensurate with the length of the contract — those with the longest contracts pay the least on a month-to-month basis. At one point, Yahoo offered a 30-day money back guarantee, but this does not appear to be the case anymore. 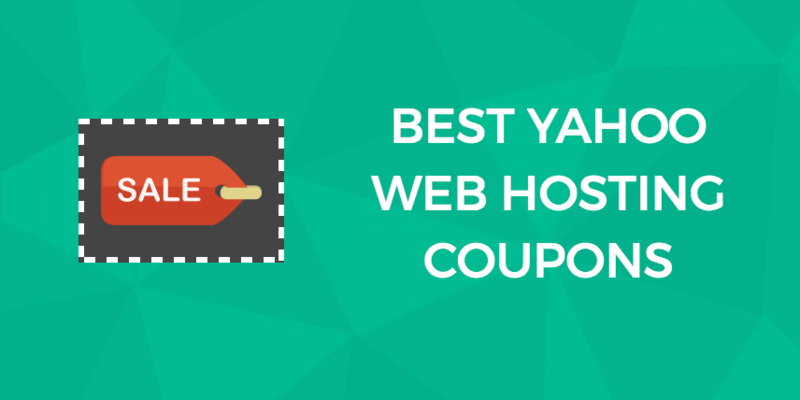 After you purchase a web hosting plan, you are welcome to cancel at any time. However, you will not receive a refund of any fees associated with that plan. Once you’ve been redirected to Yahoo’s site, you’ll see the plans from which you can choose. If you need assistance choosing the right option for your business, you can refer to the in-depth feature comparison charts, or you can call the Yahoo customer service team using the phone number displayed. Once you’ve identified the plan you’d like to purchase, click on its Sign Up button. Next, you’ll need to choose the domain for your website. If you already have a domain name registered, and you’d like to use it with your new Yahoo website, click Use your domain to redelegate your domain. You’ll provide your domain name, and Yahoo run a search to bring back the information it needs to update the appropriate domain-related records. Note that this does not transfer the domain to Yahoo — you’ll still have to pay the appropriate registration and renewal fees to the registrar from whom you purchased your domain. If you don’t have a domain name already and you’d like to take advantage of the free domain name Yahoo offers with the purchase of any hosting package, provide the name you’re interested in, and click the magnifying glass to see if it’s available. From the results of your domain name search, select the one(s) you’d like to purchase and click the plus icon to add the associated domain name to your cart. Click Continue to proceed. Review the contents of your cart, and make sure that the length of contract displayed, as well as your desired domain name, are correct. If they are, click Proceed to checkout. If you’re an existing Aabaco user, sign in to your account. If not, provide your name, an email address, and a password to create a new account. Provide your payment information. You can add a new credit card, use a credit card you’ve saved to your account, or you can opt to pay using PayPal. Finally, provide the name and contact information you want to be included with your domain registration. Indicate that you agree to Yahoo’s Terms of Service, and click Place your order to finalize your transaction. By using the link above, you’ll automatically get a 35% discount off of the first three months’ hosting fees — no coupon code needed!